There are basic differences between Standard as opposed to Olympic weight sets that anyone aspiring to get into weight lifting ought to be aware of. As the saying goes, "you get what you pay for," and this is reflected in the strengths and weaknesses of standard vs. Olympic benches, bars, and weights. There are a number of physical differences between Standard vs. Olympic benches, bars, and weights which are important to consider before making any purchase. The first issue is pure strength. Olympic bars can handle more, and correspondingly, so can their benches. Olympic bars can handle hundreds of pounds safely, with some being rated at well over one thousand pounds. Standard bars, on the other hand, usually start bending at somewhere over two hundred. The next issue is stability. Standard bars, when loaded with unbalanced weight, retain the dangerous possibility of their tipping over due to the imbalance. Olympic bars, on the other hand, are heavier and thicker on the ends, and are much harder to tip over by imbalance. Ends can be either hollow or solid, with solid ones obviously adding additional weight. Third comes torque. The revolving ends of Olympic bars combat the problem of added torque when doing certain exercises. Curls and snatches are examples of exercises helped by Olympic bars. Less torque means less eventual bar warping, as well as lessening the possibility of hand slippage. The last issue considered here is width. The width of the ends of a Standard vs. an Olympic bar, as well as the total length of the bar, are not the only measurements which differ between them. The width of the middle of the bar also differs. The thickness of the middle length of a standard bar is usually one inch. On Olympic bars, it's usually an inch and 1/16th or 1/8th. The increased thickness of the Olympic bar makes it easier to grip. Though the difference doesn't sound like much, it can affect how much you are ultimately able to lift. Note that the difference between Standard vs. Olympic weights is that Standard weights have a one-inch hole diameter, and Olympic weights have a two-inch diameter to accommodate Olympic bars with bigger ends. 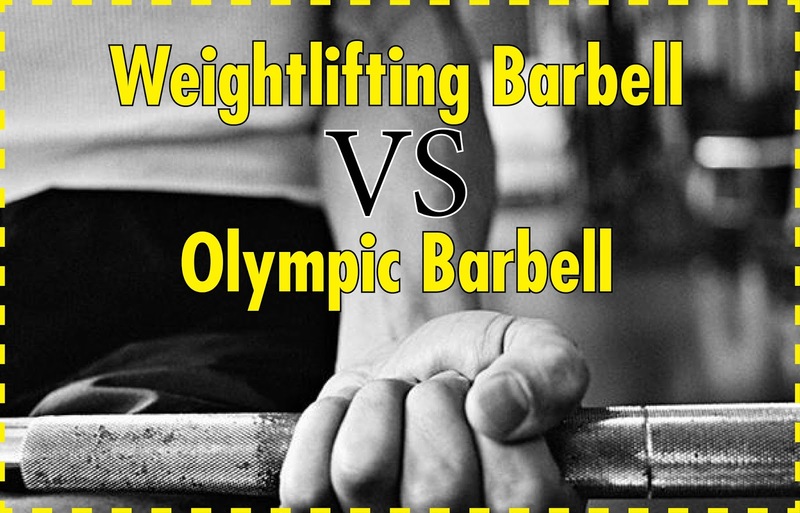 The following differences between Standard vs. Olympic benches, bars, and weights can also be classified as physical, but are likely somewhat less important that the main distinctions. One issue is rack compatibility. Power and bench racks are usually built to take bars six feet long or over. Standard bars are only five feet long, so could not be used on such equipment. As for gym and competitive venues, Olympic benches, bars, and weights are the only kind used. Another issue is deadlift assistance. Some Olympic weights are larger in their diameter than Standard ones. The consequence of this is that Olympic weights make deadlifts easier because the bar is lifted farther off the floor when starting. Standard weight benches can be found for as little as $100 or less at places like Target or Wal-Mart. Olympic benches will cost more, usually at least $200 to $300 and up, depending on brand, features, and options. Often, weight benches are not offered with bars or weights, so pay attention to this while browsing. Length, material, and solidity will all affect the price of bars, while weight, material, and hole diameter will affect the price of weights. On the whole, one can set themselves up quite cheaply going the Standard vs. Olympic route, but Olympic bargains are there to be found, especially for used equipment such as is often offered on Craigslist. There is definitely a trade-off made when opting for typically less-expensive Standard weight equipment. Olympic benches, bars, and weights are meant to withstand more, offering abilities and conveniences geared toward the serious weight lifter. Standard sets are a fine way to start out for the novice, but for anyone who is serious about establishing a regimen, life will be made easier by investing time and money in a quality set of Olympic gear.